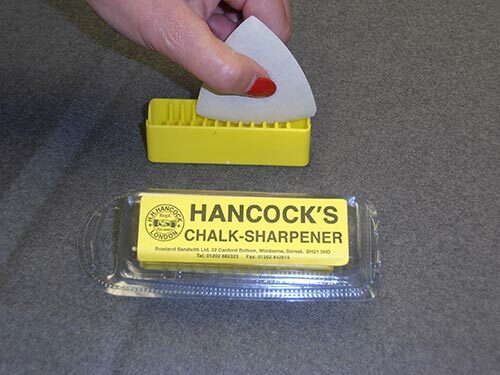 Ideal for maintaining the all important edge on all marking chalks. Sold individually in display pack. Beeswax is a natural product and therefore varies in colour. It is used to waterproof and strengthen the thread from damage. Packed 48 pieces per box weight approx 1 KILO. 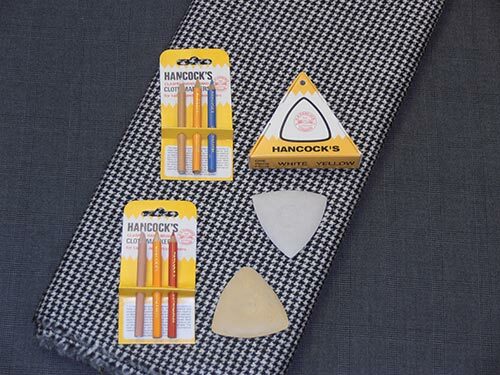 The Hancock’s pattern pencil is specially formulated to give a very dark graphite mark. 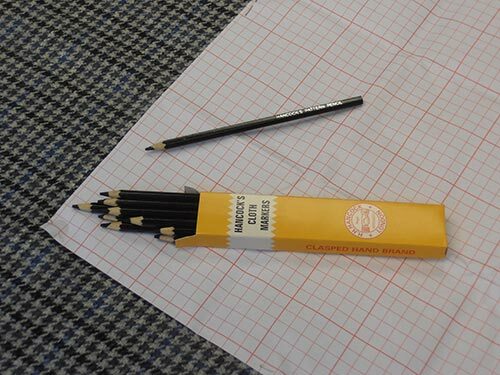 It is used on paper patterns for tracing shapes or for original design particularly in home dress making. Suitable for use in conjunction with perforated type paper lays. Available in white, blue, red or black. Available as white Frenck Chalk and it can also be produced to the press-off formula. It can also be produced for use with an Ultra-Violet lamp which then shows the mark as GREEN FLUORESCENT which glows under the lamp. 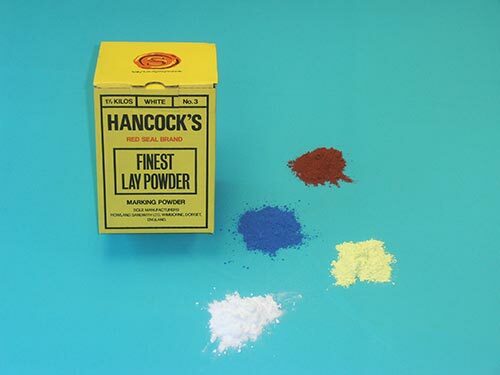 Dark coloured powders should be used with EXTREME CAUTION on pastel coloured material. The standard precautions should always be taken before marking–up. 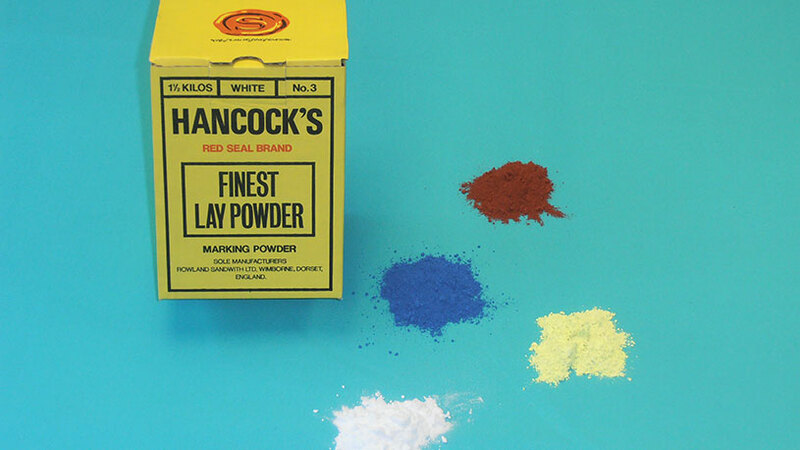 Professional Garment Marking Chalk for the home dressmaker, the marks are normally removed by light brushing. 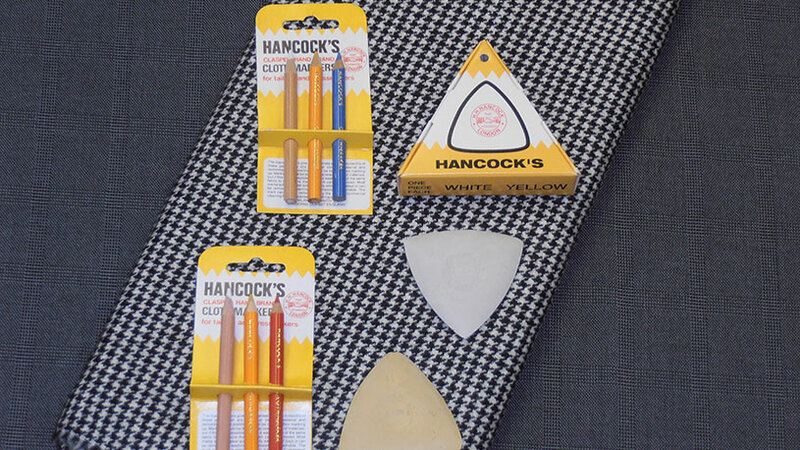 Packed 1 triangle piece white and 1 triangle piece yellow per display carton for peg-board or counter presentation. Packed 10 cartons per outer box. 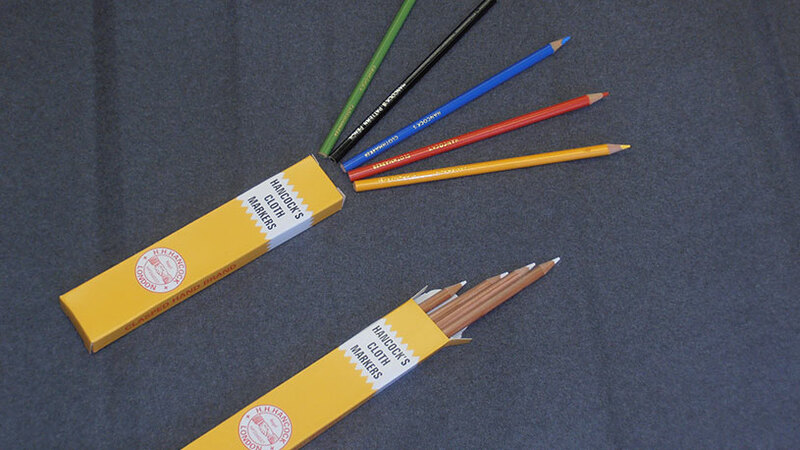 Cloth Markers supplied as 3 half-length pencils on a printed display card, 12 cards per outer box. Available to mark in white, yellow, blue and red packed in any combination of 3 colours to the customers requirement. The standard precautions should always be taken before marking up. 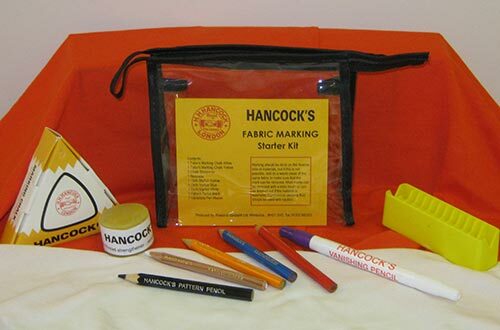 The Fabric Marking Kit is designed for use by students studying clothing design and manufacture or interior fabric design. It is also ideal for the home dressmaker or sewing hobbyist. 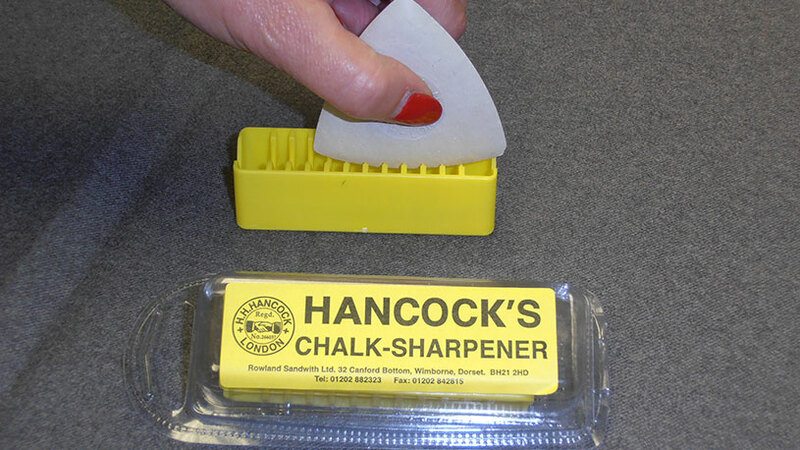 It contains Garment Marking Chalk often known as Tailors Crayons together with a Chalk Sharpener for maintaining the all important fine edge. It contains a colour range of Cloth Markers often used in design and buttonhole detail and a Pattern Pencil for use on paper patterns. Included is a double ended Vanishing Blue felt tip pen complete with eraser for use on delicate and pastel materials. The pack also contains a piece of Beeswax which is a natural product and therefore varies in Colour. 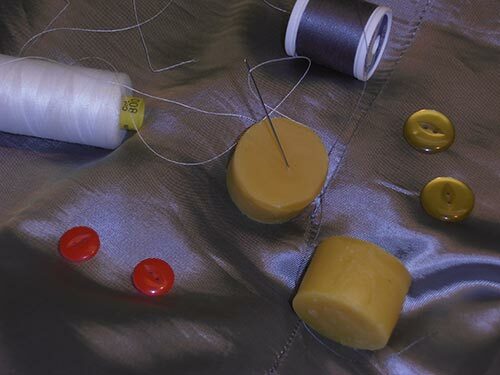 It is used to waterproof and strengthen the thread from damage in particular areas of a garment. Dark coloured markers should be used with EXTREME CAUTION on pastel coloured material. The standard precautions should always be taken before marking–up. The manufacturer give no guarantee as to the suitability of their products on any particular cloth or material and recommend that a preliminary test be made before marking up. Marking should be done on the reverse side of materials, but if this is not possible, test on a waste piece of the same material to ensure that the mark can be removed. Copyright © 2015 Rowland Sandwith Ltd. | Site by Beanjar.